Cara Delevingne threatened to get a bacon-inspired tattoo back in 2013, and the junk-food lover just recently followed through, adding a “BACON…” tat to the bottom of her right foot, opposite the “Made in England” tattoo on her left foot. Cara Delevingne showed off her new foot tattoo in an Instagram photo on September 8, captioning the snap “It happened…@bangbangnyc BACON…” Apparently the bottom-of-the-foot tat (à la Miley Cyrus’ “Rolling Stone” tattoo) is a new trend, and with her new”BACON…” ink, Cara Delevingne – always the trendsetter – now has two! In reality, Cara Delevingne’s tattoo tribute to bacon isn’t all that surprising. Just recently, Cara shared her obsession with bacon on Vine, and she told Vogue UK in November 2013 that the secret to her fresh-faced beauty is…you guessed it…bacon. In September 2013, Cara also posed a very important question to her million-plus Twitter followers, wondering if she should get a tattoo of bacon or cheese – her two favorite foods. Well, apparently she decided on bacon, and the British-born model commissioned celebrity tattoo artist Keith “Bang Bang” McCurdy to add the foodie tattoo to her foot. Cara had us all wondering about a potential new tattoo on September 5, when she shared an Instagram photo of Bang Bang presumably adding a new tattoo to her side, but the 22-year-old model has yet to show off that ink, if it actually happened. 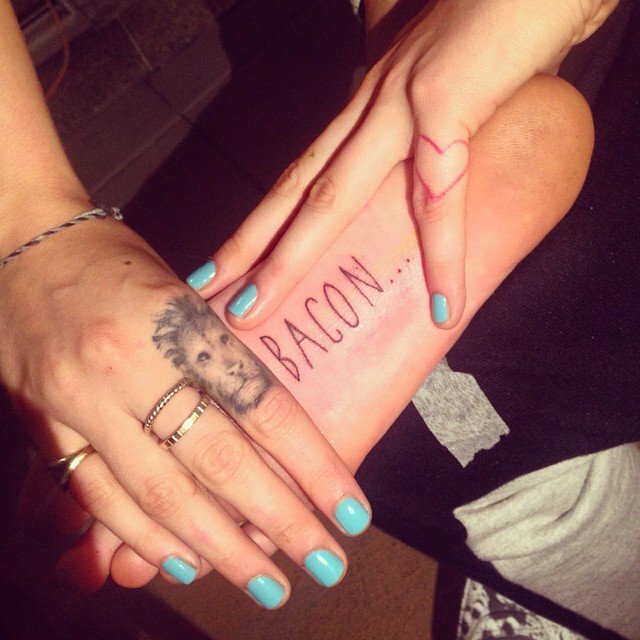 For now, we can admire Cara’s unique “BACON…” foot tat!